Christian Counselor Rx (CCRx) | Soul Care Ministries International, Inc. | Soul Care Ministries International, Inc. Prescribed by Soul Care Ministries International, Inc.
Soothing Music Therapy, Professional Bible-based Narrative . . . Depression, Anxiety, Stress and 39 other topics available for your personal use. Each individual session is provided via MP3 download (or online via Google Docs access), is approximately 30 minutes in length, and cannot be copied and sold. CD’s are available, as needed, when provided with in-person counseling and prescribed by one of our counselors. Each session also includes a Client ThoughtNotes Journal and Instruction Booklet which is provided via email. 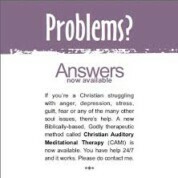 Christian Counselor Rx (CCRx) is the first professional, Bible-based counseling tool with over 20 hours of Christian meditation conformed to a library of 42 different 30-minute sessions that our counselors can provide for over 40 of life’s most difficult issues, such as Depression, Anxiety, Addictions, Stress, Grief, and 37 more problem areas. Due tragedies experienced by Christians who have struggled with Depression, Soul Care Ministries International, Inc. has partnered with Soul Care Research, LLC to provide this invaluable resource free of charge (regular price is $29.95). See below on how to purchase additional personal CCRx Help Kits relating to 41 other topics. This offer is available to Christians who suffer with Depression, Christian counselors, Biblical counselors, Christian therapists, Christian psychologists, Christian psychiatrists, mental health workers, and concerned pastors. Click image or click here for download instructions. See below for information about Certification Training and how to purchase the entire CCRx Library. The cost of each individual session is only $10.00 (delivered electronically) 0r $20 (print/mail version). You may purchase one or more sessions via PayPal, for your personal use, below. Information, regarding your purchase, will be provided by email. Are you a Christian Counselor, Mental Health Professionals, Pastor, Lay Helper or other Care-giver looking to utilize the CCRx in your counseling ministry, practice or other professional service? You may receive training and purchase the Christian Counselor Rx Professional Library via the Soul Care Ministries Institute. Our founder, Dr. Linda King, is a Soul Care Research licensed counselor and strategic partner of Soul Care Research, LLC. We invite you to learn more about the Holistic Soul Care services we offer. Please contact us should you have any questions or comments. Click here to schedule an initial no-fee consultation or appointment for counseling in person in the Metro Atlanta area or online.